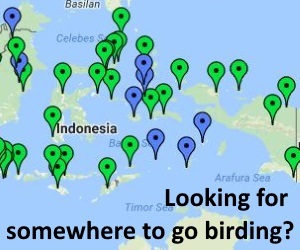 Seldom visited, but Alor at least has regular flights from Kupang on Timor, and a range of birds to merit a closer look; having affinities with Flores to the west (Flores Hawk Eagle & Flores Green Pigeon), Timor to the south (Timor Stubtail, Timor Cuckoo Dove) and Wetar to the east (Alor (Crimson-hooded) Myzomela)! Not to mention potentially viable population(s) of the critically endangered Yellow-crested Cockatoo. Pantar is more difficult to access, but coastal mangroves on the north coast are a reliable site for the endemic form of ‘Southern’ Boobook shared with Alor, likely of course to be a species in its own right. Yellow-crested Cockatoo, Flores Hawk-Eagle, Olive-headed Lorikeet, Black-backed Fruit-Dove, Flores Green-Pigeon, Timor Cuckoo Dove, Little Cuckoo Dove, Parzudaki’s (Ruddy) Cuckoo Dove, Alor (Southern) Boobook, (Australian) Barn Owl, Mees’s Nightjar, Elegant Pitta, Alor (Wallacean) Cuckooshrike, Alor (Crimson-hooded) Myzomela, Black-fronted Flowerpecker, Flame-breasted Sunbird, Flores Spangled Drongo, Chestnut-backed Thrush, Sunda Grasshopper (Timor/Russet Bush) Warbler, Timor Stubtail, Common Hill Myna, Wallacean (Spectacled) Monarch and a good few more! This single area holds the majority of key bird species, including Alor Boobook, Sunda Grasshopper Warbler, Alor Myzomela, Flores Hawk Eagle, Yellow-crested Cockatoo, Mees’s Nightjar, Alor Cuckooshrike, and Flores Green Pigeon. The key birding sites are within the forests around the villages of Apui and Subo, and along the road north of Apui heading to the coast. The first is a trail heading from the village of Apui through mostly disturbed and now fairly open Eucalyptus dominated forest to a telecom tower on the adjacent southern ridge – ‘the Telecom Trail’. The ridge itself has a non-metalled road with disturbed habitat on either side at elevations around 1000m plus. The trail and road area is where Philippe Verbelen first discovered the population of Bush Warblers that are currently assigned as part of Sunda Grasshopper Warbler. 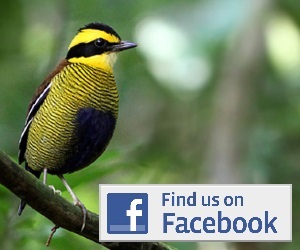 The birds can be found in suitable dense grassland understorey within forest and forest edge. The higher altitudes along the trail and ridge are also a location for the recently discovered Alor Myzomela. Other bird species along this trail can include Alor Boobook, Flores Green Pigeon, other pigeons and doves, Flores Hawk Eagle, Elegant Pitta, Lesser Shortwing, Timor Stubtail, Olive-headed Lorikeet, Spectacled Monarch, the island endemic Alor Cuckooshrike and Flores Spangled Drongo. A second area worth a look is on the northern edge of the village around a small river valley with two bridges over streams, the ‘two bridges area’. Although the forest has been mostly cleared from here, it is still a good location for nightbirds, with Alor Boobook, Barn Owl and Mees’s Nightjar all possible. Chestnut-backed Thrush, Lesser Shortwing, Timor Stubtail, Elegant Pitta are also present. Basically any area around Apui and Subo with forest is likely to hold some interest – so it is mostly a case of finding forest areas with suitable access! The road from the north coast to Apui climbs through valleys with some areas of intact forest. Viewing into these valleys on either side of the road is likely to give you the best chance locally of seeing Yellow-crested Cockatoo, Flores Hawk Eagle and Flores Green Pigeon. The mangroves south of the town of Baranusa have become a reliable place to see the endemic form of Boobook on the island – Alor Boobook. Access to forest is possible on a small road south of the town, which skirts the bay. The owl can be seen in forest along this road about 7km south of town. Early visitors also heard another nocturnal bird calling from the mangroves that sounded suspiciously like a Scops Owl. Further investigation has now suggested that the ’Pantar Scops Owl’ is more likely to be a Black Bittern producing very owl like calls. Thanks particularly go to Peter Collaerts and his trip report; “Birding Trip Report to The Lesser Sundas, June 19-July 17 2011” for information on Pantar – as well as other information from around the Lesser Sundas. A number of other sites are provided in literature. A good starting point is “The Avifauna of Alor and Pantar, Lesser Sundas, Indonesia by Colin R. Trainor, Philippe Verbelen & Ron E. Johnstone. Forktail 28 (2012): 77-92”. GPS locations of sites are provided in this publication for some of the key species mentioned above. Alor can be reached by air from Kupang, with daily flights to Kalabahi (the airport is out of town on the north east coast). Ferries to Kalabahi on Alor are possible from Timor (Kupang) from the south, and Flores (Larantuka) via Lembata (Lewoleba) and Pantar (Baranusa) to the west, but these will take some time out of your schedule. The Flores to Alor ferry is also only likely to be once a week. In Kalabahi there are a number of hotels and homestays of varying price and comfort. It should be possible to organise private vehicle hire in town by asking at your accommodation. There are also taxis that will be able to take you around the island, including to Apui, which is along a metalled road (but steep in places). Getting to Apui from Kalabahi should take about 1.5hours, so it is possible to treat it as a day trip. A local shared taxi/pick-up also seems to go daily between Kalabahi and Apui, it is easier to find the schedule in Apui than Kalabahi though! Accommodation may be possible in Apui via a basic homestay. The best approach is to go to the village and ask for the village head and/or present yourself at the local government office, near the school. The village has been welcoming to visiting bird watchers, and can provide a local guide service to show you trails and the local area, as well as the basic homestay. You may also be able to hire motorbikes. The trail to the telecom tower at the southern edge of Apui is indistinct at first as there are a number of small trails from the village that eventually lead to the main track up to the ridge. Once on the main track, the climb is steep to the summit and telecom tower. An alternative is to approach the tower from the ridge road, which is a non-metalled track that leaves the main road about 1km west of the village of Subo. Getting to Baranusa on Pantar should be possible from Kalabahi on Alor, although the regular daily passenger ferry may be out of operation, as it appears to have been in recent years. Asking around the harbour is probably your best bet, and if the public ferry service is not running, finding a charter may be the only option.